On December 14th, 2006, When His Majesty the Fourth King handed over his duties as king to his son, His Majesty Jigme Khesar Namgyel Wangchuck, the ministers who were attending the ceremony shed their tears silently, common people across the country were shock and felt helpless, and I went speechless. I thought it was a bad dream. For us Fourth King was the personification of God himself and I had a wish to live and die under his rule. It was the hardest to accept that the King we loved all our lives was resigning at the age of 51, changing the course of history and tradition. But what we didn't realize was his vision of happiness for his people. And today, after two major events in the history of the nation- the coronation of the His Majesty the King of Bhutan and the Royal Wedding, when I look back it brings tears to my eyes as I understand how great a gift our Fourth King has given us on that fateful day in 2006. Never in the history of our country, or any other country, a father king crowned his son. It was always after the passing away of the father that son gets crowned. For the first time in the history the raven crown was worn on the head of king who was perfectly happy during the crowning ceremony. And that glory reflected in lives of every Bhutanese. And that was the Gift from the Fouth King that we didn't understand back in 2006. Never in the history of our country a queen was crowned in the presence of her father in-law. Ashi Jetsun Pema Wangchuk was the first queen who received Dhar Negnar from the dotting father King. 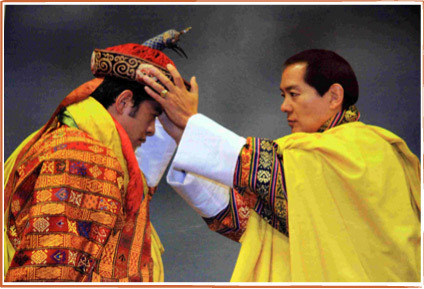 The Royal Wedding became so special just because there was the father king to bless them and this is the blessing to the people of Bhutan that we didn't understand back in 2006. And every morning we wake up to the love and grace of the charming young King without having to miss our former King just because we know he is still there watching us, and that is the daily happiness we enjoy and it's the gift from the Fourth King that we didn't understand back in 2006. Now, there will be another moment in our own time when our Crown Prince will be born, who will be the first crown prince to receive the blessings and wisdom of his Grandfather. That shall bring immense joy to us all. Thank you Your Majesty, now we know why you did what you did in 2006. You are truly the God of happiness. 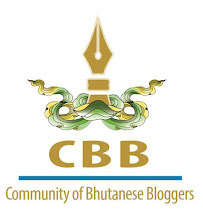 Passu Diary- Journal of an Ordinary Bhutanese............but its not Ordinary....wow....love your writing.. I think you are very rare young man. So much of wisdom in your thoughts and writing. Thank You for being Passu. Akashic, your words humbled me throughly. All my waking hours I will try to be better, wiseer and worth your praise. Thank you so much. Dear kuenzang, Monument and Dechen, you guys are my regular doses of motivation, which give extra muscles to my writing. Thank you so much. Good writers are hard to find and I foresee you will become one of the famous writers in the next 5 to 10 years if you keep with the same pace. I really like the way you organize things in your writings..